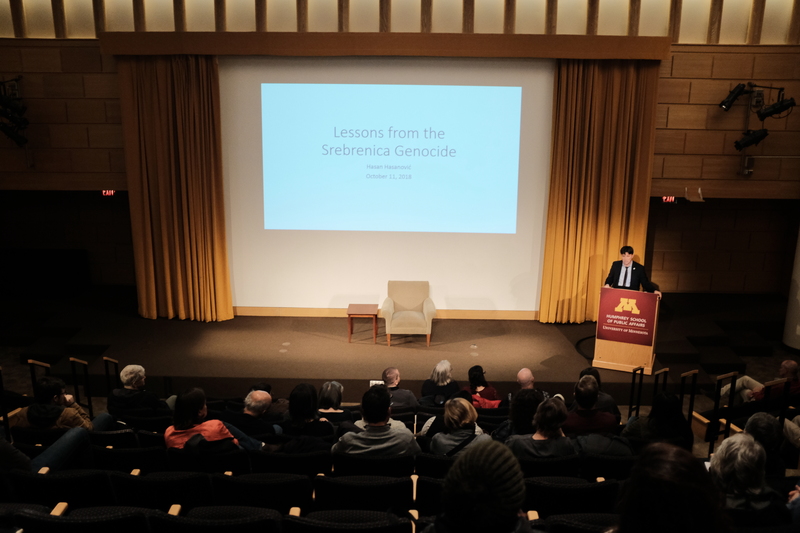 In October, the Center for Holocaust & Genocide Studies welcomed Hasan Hasanovic to campus to discuss his experience as a survivor of the Srebrenica genocide. Mr. Hasanovic was 18 when Bosnian Serbs systematically murdered more than 8,000 Bosniak men and boys in July 1995. Since then, Mr. Hasanovic has written an account of his story, Surviving Srebrenica (The Lumphanen Press, 2016), and spoken around the world on the topic of Srebrenica and genocide more broadly. For the last decade, he has served as a curator at the Srebrenica Memorial. Joe Eggers: I’ve watched several of your interviews on television and especially your presentations at schools. What’s one message you hope they take away after you speak? Hasan Hasanovic: It’s interesting. After the Holocaust, the whole world said “never again.” And very similar things were [still] happening afterwards—in Rwanda, Darfur, Cambodia, Bosnia. It’s happening here and now with Rohingya Muslims. Now we have this situation in China with Muslims—one million are being held in labor camps. Somehow we don’t have a mechanism to prevent these atrocities. We talk about them after ten, twenty years, and we feel sorry for victims and we try to say something about it and try to educate people, and that’s it. But what is lacking is that global mechanism, which should be the United Nations. Sadly, world powers have different interests and those interests are standing the way of global intervention and prevention of mass atrocities. I’m trying in a way to make a point that we need to talk about it and to make sure we keep that memory alive and to educate people, but at the same time remember that it’s still happening. And my hope is that when I talk to these audiences—that some of them will become politicians, some of them will pursue other professions—they will use this story and other stories of other atrocities in their lives, as a lesson, and they will become better individuals, better politicians, more humane politicians. And if they get a chance…to decide something that they will make an appropriate decision, thinking from a humane perspective, rather than the perspective of the interests of their political party or the interests of that power. Thinking more collectively about humanity? To that point, I watched one of your presentations you did at a school in London back in 2015 and there was a lot of talk about the dangers of othering people. How have things changed in Bosnia in the last 23 years? Are communities still divided? Is Islamophobia still something you’re experiencing in Srebrenica? You know, the war ended with the signing the Dayton Agreement, which actually divided the country into two sections. One is the Republic of Srpska governed by Serb political parties. Bosniaks-Muslims and Croats are minorities, so they don’t even have a voice there. They are basically treated like second-class citizens. In the other section, it’s a mostly Muslim-dominated autonomy and 20% Croats. There are different perspectives of what happened during the past. Serbs have their story, Croats, Bosniaks-Muslims, et cetera. The war ended without a winner, so all the three sides are writing their own history. Each one of them have their own perspective of what happened, which actually prevents us from having one common narrative and to build a brighter future for our children. We are faced with the constant denial of the genocide, like the downplaying of war crimes in Bosnia, through political media and academic elites from Serbia and this Bosnian-Serb autonomy. An entire new generation of Serbs are being taught the wrong historical facts. They are being taught that the ICTY [The International Criminal Tribunal for the former Yugoslavia] is biased, that it’s anti-Serb, that the whole Western world is against them, and that what happened in Srebrenica is nothing, that it’s not genocide, which actually prevents them from going through the process of trying to admit what happened and consequently hinders the process of reconciliation. Without a genuine confrontation with the past, it’s impossible to go towards any reasonable reconciliation. Now in Bosnia, the situation is like this: the country is divided, perspectives of the past are different. I’m still waiting for some sort of international intervention in this case, to bring people together as we should be again: Bosnians. We should have one Bosnian identity. That’s what the international community was supposed to work on: bringing us back together. If people in Rwanda could get back together after 800,000 people were killed, what about us in Bosnia? We are the same race, basically the same ethnicity! We got separated only because of different and divisive political interests over all these years. When we line up say 10 people—Muslims, Croats, Serbs—and you mix them up and put them in a line and ask an outsider “could you identify their race, their ethnic background?,” that individual would say these guys are the same race, the same ethnicity. We have more things in common than we have things that break us apart, so we should work on that, and this work should be encouraged by the international community. Because we had a terrible war, we had to recover from the war, and now is the time to work on this issue, because these issues are very important for our children! If we don’t confront our past, we cannot build a better future. It’s impossible to forget about the past, and because it has been 24 years since the war, I think now is the time to start facing what happened. I think once the situation changes in Serbia politically, then it will affect the Bosnian-Serbs and that would be better for all of us. Sadly, I think those in the current government have never given up on the ideology of wanting to have a greater Serbia, which is the biggest problem and the key problem of the entire situation. They still have aspirations to have that Bosnian autonomy governed by Serbs (as a part of that project of a greater Serbia). That would be a big problem. It would probably ignite in other conflicts, which we don’t want, that would be probably a much bloodier war than the previous one, which was much bloodier than the Second World War. Humanity has in a way progressed with science, technology, everything, but in our mindsets, we have regressed. We keep coming back and repeating the same mistakes from our past, killing one another, and we don’t do anything about it. The question is: How is it possible? What is wrong? This is a very difficult question. So what is wrong with us as a world, as humanity, that we keep letting these things happen. We have big universities all over the world, we try to educate people, but these things are repeating again, all over, all over again! That’s why it’s very, very important that we educate young people. I just find it very important that we teach these young people—some of them will become politicians, some of them will run this state and other states—about the Holocaust, about subsequent genocides, as much as we can. Just to make them understand and have a connection with the current situation here or globally. That they can have a global picture and understanding of what is happening. That is very important. You’ve talked a bit about reconciliation, but I wonder for you personally, being a survivor and losing so much during the genocide, what does forgiveness look like to you? Or is it something you’ve really thought about? Because of this situation with the denial of genocide and continuation of Serbian political program of wanting a greater Serbia, we have never been approached by anybody to ask for forgiveness. So nobody asked me for forgiveness, and I don’t have anything to forgive basically. I can possibly forgive what was done to me individually, but I have the right not to forgive on behalf of my father and my twin brother, because I don’t know what happened to them. I don’t know how they were killed, how much they suffered, if they were buried alive in mass graves. So who am I forgive in their favor? When you ask Holocaust survivors about this, all they say is that it’s very difficult to forgive, almost impossible to forgive. But it would be easier if the people we are talking about would have admitted it, if they would have approached to us and said okay, the Milošević regime did it. I never talked about Serbs as a people but about the Milošević regime and the Bosnian-Serb army and the militants from Serbia. It would be unfair to stigmatize the whole nation for the wrong-doings of the regime. If someone, from the current government (in Serbia ), would say, “it’s Slobodan Milošević, they feels sorry! What can we do to maybe rectify some things, to build a better future for our children,” it would be easier for me really to think about that, but they don’t even give me a reason really to think about that. In 2010, the Serbian government apologized for the “massacres” of Srebrenica but stopped short of calling it a genocide. For you, why is it important for it to be called a genocide? Because of the way my father was killed, how my twin brother and how my uncle were killed; the circumstances under which they were killed were judicially established by the ICTY, the ICJ [International Court of Justice], and the Bosnian party. Calling it other crimes would mean that they were killed under different circumstances. So, I don’t know why there is a problem for Serbia to accept the judicially established truth. The truth is much worse than even the tribunal has established. The tribunal never get to know the real human suffering. They only deal with facts and numbers and what happened. They never talk about the suffering of people, not just when they were being killed and wounded, but afterwards what happened with mothers, with sisters, with wives, with me, with survivors. There is no verdict in this world which would be enough, good enough, for those killed. So I think it’s a political thing you know, because genocide is a source of shame. So probably, knowing that Serbs, as a part of the Bosnian-Serb Army and Police, committed the genocide, is a big stigma for the entire nation. I am afraid that they will never accept it as genocide unless they are really pressured by the European Union, from Americans. Without this acceptance, I’m sure we will have a continuation of unfriendly relations among Bosniaks-Muslims, and Serbs in the territory of the former Yugoslavia. Without recognition of this as genocide, I don’t see that there would be genuine reconciliation between these two peoples. I think probably the key issue of solving the crisis in the territory of the former Yugoslavia is the relations between Bosnians and Serbs. Of course, there are lots of problems with Kosovo and with Croatia, and Serbia has a lot of these issues it hasn’t been able to solve. But I say again, it shouldn’t be a problem. If the two highest (UN) tribunals have established it as genocide, everybody is, in a way, obligated to respect it. If you are a member of United Nations, you are obliged to respect the conventions and the verdicts of that tribunal. In the West we have this very legalese perception of justice, that justice is administered through the courts. But as a survivor, do you feel there has been a sense of justice through the ICTY and tribunals, even though denialist rhetoric is still commonplace? That’s a really good question. I would say that justice hasn’t been served completely. We were given some justice. Everybody had expected the ICTY to bring complete justice, to bring people back together, to reconcile people. Those expectations were not real. How could someone expect such a small institution to fulfill such a massive mission? But they’ve done amazing work in establishing judicial facts, which are now, in my understanding, the only independent source [on the genocide]. You have these different narratives from different groups, and you have the ICTY’s independent source of information, judicially established information. In this sense, the work of the ICTY is precious. They brought only a small number of people to trial for Srebrenica, only 18, not 80, to speak for Srebrenica. Most of them were convicted of genocide and for some other crimes against humanity, a group of them were convicted for being members of a joint criminal enterprise, which means that behind the genocide, there has to be a system, either state or, in this case, the Bosnian autonomy called the Republic of Srpska, which is a very, very important verdict. Most of the criminals, probably 95%, will never face justice, because we would need hundreds of these tribunals and millions of dollars and victims are dying and witnesses are dying. It’s difficult to testify—the standards when it comes to these tribunals are very high. It’s very difficult to convict someone; you have to see that someone killed someone. It’s not just enough for basically someone to say, “I saw someone who was a soldier in Potočari, in Srebrenica during the genocide.” It’s not enough to get even an indictment, not to mention a conviction. Because of this, many people got discouraged and have said they’re not going to testify because it’s very difficult to get a conviction. At the end of the day, though, I think what is important is that the ICTY established amazing archives of judicially established facts, which we can use in many ways now to learn what happened, so academia can use it as a source on Srebrenica, to learn about that. And another thing was that what happened was established as a genocide. It’s very important, it’s another source of comfort for the victims. Another important thing to note is that most of the victims were found in mass graves and excavated and identified by the ICMP and the International Commission of Missing Persons. Eventually it led to the memorial which was established by the international community in Potočari and near Srebrenica. We have international recognition of what happened, we have those archives of information, of judicially established truth, we have the place for memorial where we can keep the memory alive. The issues I have mentioned before—denial, unreadiness from Serbia and the Bosnian autonomy to admit—prevent us from reaching a greater sense of justice–and I don’t know when, or if, that would ever happen. But I thought that [Ratko] Mladić and [Radovan] Karadžić would never be arrested, I thought only a couple thousand would be identified and buried, but now we have almost 7,000. 7,000 who were identified through scientific DNA, which is exact science, common sense cannot deny it. It’s unbelievable! So we have many achievements and we also have many expectations in terms of wanting Serbia and Bosnian Serbs to accept it as genocide and for us to be able to move on with reconciliation. I’m curious about the Srebrenica Genocide Memorial. Memorials really serve two main purposes; allowing a place for families and communities to mourn and honor victims, and educating the public. How does the memorial and museum in Srebrenica balance these two goals? I think it fulfils both. It honors victims; it has a cemetery where they were buried; there is a museum there where their stories are told and where there is a narrative of what happened. Thousands of people from all over the world come to visit the memorial, and people are being educated about what happened. And of course, we need to connect more globally. It is a very young memorial—the genocide happened in 1995; Auschwitz and other memorials took a long time to start being developed and built. I believe that the Srebenica Memorial is growing and that, with time, we will have more things there and will connect it with other, similar memorials and attract more people. We will focus even more on educating young people, trying to affect them, trying to make them think more of what happened for their own good. One thing I’m always interested in is how memorials are reflections of the communities. How would you say the Srebrenica Memorial is a reflection of your community? With Srebrenica memorial and the cemetery, I would say 99.9% of victims memorialized there are Muslims, because they were targeted. There are not Serbs in the Memorial because they were not in Srebrenica during the siege. At the start, it was very difficult to even establish the memorial and it was basically created by a decree from the international community, from the High Representative. The American government and the American embassy has always been a big supporter of the memorial. What has the local response to the memorial been? Local Serbs follow what their position, the Serbian government and the Republik of Srpska government, says on television—they didn’t like the memorial being established there. I think, as years go by, they have accepted it. We have never had any incidents. I’ve been working there almost ten years and nobody has even said an insulting word to me. They know everybody knows me and I work there and I have a lot of public exposure. I think they know what happened and they are very much afraid to admit it, because if you admit it, there would be consequences. 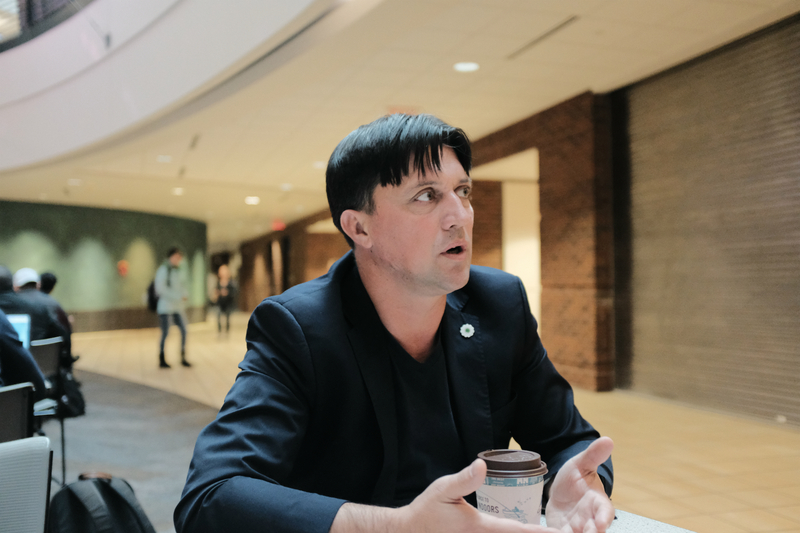 Because it is a small space and Bosnians aren’t a big population, and if you say something—for instance, admit what happened in Srebrenica—you may lose your job: as a professor, as a teacher, as anything. And if you lose a job, it is difficult to find one later. At the same time, being called a traitor, you’ve betrayed your ethnicity. It’s too much for people! Someone will say, probably in private, “yes it’s happened,” but I cannot afford to lose a job, I cannot afford for my family to go through this torture of me being called traitor and then people talking about me. Then Bosniak-Muslim community there is mainly families of victims. People almost never got to talk about what happened. I call this a culture of silence. People talk about sports, weather, agriculture, but almost never about the past because we know what to expect from one another. You don’t want someone to spoil your day if you ask what happened? And they say, “It didn’t happen.” There is no point even in arguing about this, especially if you are a survivor or a mother. People don’t really talk about this because they know what to expect. When I was in Armenia in 2015 during the centennial of the Armenian Genocide, I was shocked by how absent the Genocide was in the public conversation. That was an event a century ago; I can’t imagine what it’s like only 20 years later in Srebrenica. This is a problem. We still feel this burden of the past on our shoulders. An outsider, someone who comes to Srebrenica, and says, “Oh it’s beautiful!” by which they mean it’s a beautiful town, and the countryside, it seems almost unreal; the setting and it is so surreal. And at the same time, someone will say, “Oh people are functioning. What is the problem here? Everybody’s talking.” But it actually takes a number of days, month and months—I don’t know how many days—for an individual to spend with people and really immerse themselves with the community to understand these things that I’m talking about. Many members of survivor communities, especially those who fled, swore never to return home. I’m thinking of survivors of the Holocaust. Why was it important for you not only to return but to be present and active in Srebrenica? When I buried my father and twin brother, that hit me very hard. It actually changed my life forever. When that happened, I was unable to deal with that as a human being and I had nobody to talk to, and because the country was destroyed after the war, there were no such services that could help for free. So later, surviving my trauma and surviving my dreams and being hunted in my dreams, I decided to go back to the actual place at the root of the whole thing. That’s how I thought I would heal myself. And I think now I am much stronger than I was when I buried my father and twin brother, that was 2003 and 2005. Ever since, I have done so many things, travelled globally. It’s not a job for me, it’s a mission. That’s what I owe to brother and my father and my uncle and everybody else because they are speechless. I did not survive because I was better. I think I survived to tell what happened to me and especially what happened to them. I feel that moral responsibility, that I should not escape and get away from that. I could have gone, I could have escaped, I could have gotten a job easier anywhere, anywhere in the world. And just to get away from there and say, you know it’s too much, I cannot live there. But what if we all run? What if we all leave these people and nobody would talk about them? It’s very easy to get away from problems, but it takes courage and dedication to do something as noble as a job at this Memorial here (Srebrenica genocide Memorial). Moving forward, how do you envision the West helping raise awareness and recognition of what happened in Srebrenica? There is this charity in London called Remembering Srebrenica. In 2013, I went there with three survivors, and we met with the then Prime Minister, David Cameron, in his office to educate him and others. Ever since, they’ve been educating people, organizing over 450 events throughout the UK every year. They work with schools, they talk in schools, they educate teachers, they encourage them to teach children about what happened. They organize Memorial Week in July there, where top politicians come to attend to hear survivors’ stories. They bring children and professors and politicians to Bosnia, to Srebrenica, to learn and some of them will be affected and they will pledge to do something. They intend to build an education center and global memorial in Birmingham where students in the UK will come to learn. This is what every country, especially big ones, should do for any genocide: Armenian genocide, Bosnian genocide, Rwanda, Darfur. Memorials and education about Holocaust has been developed everywhere, so in a sense, it’s finished—almost. We should never forget it—genocide as crime against humanity, as much as it concerns me, it should concern you and every human being on this planet. It’s not the type of thing to say, “Okay it happened in Bosnia, I don’t care.” No, no. It concerns you because it happened against human beings and we should all be concerned. That’s why I say this big country, the United States, should have such a center, maybe to have all these major genocides in one center where children will be taken from schools to visit. It could be a project for the government. I don’t know who should initiate it or how, because it’s difficult to get people to listen to you and take an idea and support an idea. I think it would be the best thing that anybody could do for humanity and for these children and for the students. Joe Eggers is the Research and Outreach Coordinator for the Center for Holocaust & Genocide Studies.